The nearly new sale on Saturday raised over £300 towards the target of £3,000 which June Leatham has set herself for the Cambridge Mongolian Disaster Appeal (CAMDA). CAMDA supports Mongolian nomad farmers trying to recover from the harsh winters of 2000 and 2003 which killed many of their animals. The petition organised by Alison Wall to stop Hampshire County Council's withdrawing its financial support for the weekly service to Newbury and all the Sunday bus services was unanimously supported by Saturday's shoppers. The effects of removing the subsidies will mean the end of the weekly service to Newbury, which many residents of the villages between the town and Newbury rely upon for their weekly shop. The Sunday services to Andover, Basingstoke and Winchester will also be lost. Those with Sunday jobs or wanting to visit friends or relatives in hospital will be forced to rely on private transport and its high costs. The subsidies currently come from Hampshire County Council, which is looking to remove those in excess of £2 per journey; the Whitchurch costs are estimated at £2.11. Alison says "Not everyone can drive or afford a car. They are the ones who will suffer. Are Whitchurch residents not worth 11p?" The open sessions on 13th and 17th September have attracted many good burghers of Whitchurch to put their names forward to be on the committee of the new community group. If you want to be a committee member then details of the roles, responsibilities and how to apply are here. A public meeting will be held in the Methodist Hall at 10am on Saturday 15 October when the constitution for the new community group will be adopted and honorary officers will be elected. All are welcome to attend. Whilst there are lots of people involved in the good things happening in Whitchurch (see the news above) there are those in the community with the opposite intent. 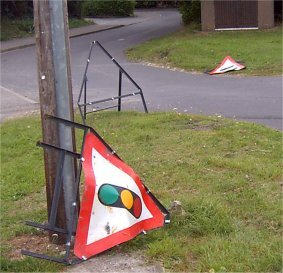 The safety barriers and road signs around the road works on Winchester Road were vandalised on the night of 18th September. 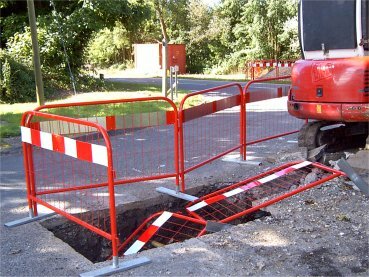 The signs and barriers are there for safety reasons so who in their right mind would want to put pedestrians and road users at risk by removing them? Possibly those who wrecked the Silk Mill Bridge or uprooted the wooden traffic bollards outside the Spar shop? Tim Fisher, organiser of the last Church Barn Sale of the year, had to admit that the last thing he expected to have to deal with was the need to shade stalls from the sun. But a glorious early Autumn morning meant that the temperature was soaring when the first buyers of the day arrived. Trade was brisk and, although temperatures dropped a little in the afternoon the sale was deemed a great success, with over £185 raised. The Oaktree Nursery in Whitchurch has several garden beds and has been growing a wide range of vegetables and flowers. Two of the vegetables are special. The seed cannot be bought because of European Union legislation which requires the costly registration of vegetable varieties. Lots of old, but tasty varieties, can only be grown from seed saved by enthusiasts. The main organisation in the United Kingdom that preserves the seed of old vegetables is the organic gardening organisation, the Henry Doubleday Research Association (HDRA), based in Ryton near Coventry. Each year the HDRA's Heritage Seed Library distributes free seed to its members. Some of the members agree to become “guardians” by saving some of the seed from the plants they grow and sending it back to Ryton for distribution to members in subsequent years. The Oaktree Nursery has grown 2 tomato varieties, Cavendish and Derby Striped Yellow and Green. This week some of the crop has been harvested for seed (most of the fruit having been eaten by the children and staff). 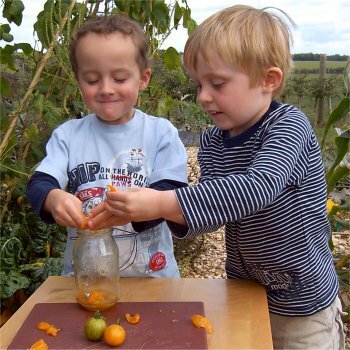 The picture shows Sam Auchterlonie (left) and Daryl Tigwell squeezing out the seeds into a jar before they are “fermented” for a few days to start the process of turning them into the nice clean seeds that you find in seed packets. The nursery will be keeping some of the seeds for itself to grow again next year and distribute to the parents of its children. Testbourne's Large Hall was packed on Saturday night for the September Ball. 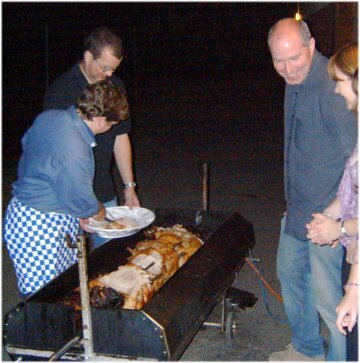 The event commenced with a Hog Roast meal and continued with dancing. 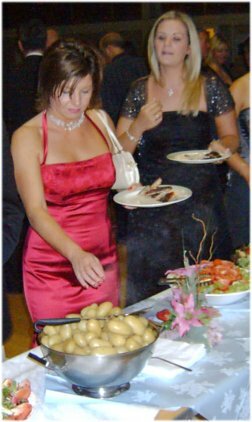 The event was to raise funds for the 1st Whitchurch Scouts. 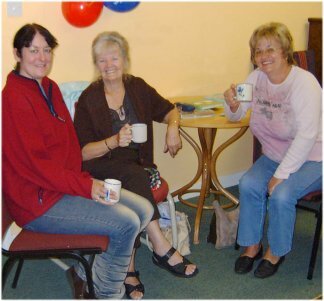 At least 2 coffee mornings were held to raise money for Macmillan Cancer Research. 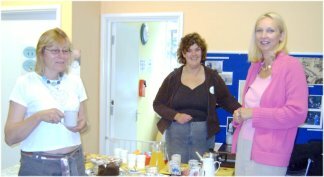 The Testbourne Tea Pot saw a steady stream of customers and it would appear that both they and the workers enjoyed the event.